A Ockershausen:	I met our very special guest probably 40 years ago or close to it, in the lobby at WMAL, she was waiting for an interview. I want her to tell that story. To me she was Kathy Cunningham, but over the 40 years that she has been in Our Town, she’s accomplished so much. You know, far less being the anchor at WMAL-TV, but WJLA. I still call it WMAL-TV. She had a top level position at the Marriott Corporation. She ran for Congress, and she’s going to be named Head of the Democratic Party for the state of Maryland. But my friend and very dear friend, Kathleen Matthews. Welcome to Our Town. Kathleen Matthews:	Hey Andy, how are you? It’s good to be here. A Ockershausen:	Well your first day on the job was at WMAL. I knew that you had gone to Stanford, and you had a great educational background. I said why would this woman with all this talent, want to work at this radio station? And you came in the lobby. Kathleen Matthews:	So I have to tell you, that as I came into the lobby up from the first floor, through the elevator. I felt like I was going in this time-warp. It was still so familiar to me, and I will never forget getting off that elevator, coming into the lobby, and hearing the voices of Harden and Weaver, and the incredible electricity that this place exuded. It was joyous. It was fun. And I had been looking for a job for a couple of months, having graduated from Stanford. Kathleen Matthews:	Coming across country, wanting to be in the nation’s capital because I was passionate about politics. I wanted a new adventure, and I really believed in journalism. Because this was after Watergate. This was after Woodward and Bernstein had broken open the whole Watergate crisis, and Nixon had resigned. And Washington was like the center of the universe at that point. And so here I was in Washington, in this amazing environment. And I walked in the door, and I thought if I can work in this place, I will be the luckiest woman on earth. And I came in and did a series of interviews. And I remember meeting you too, because you’ve got that same energy that really represented what WMAL radio was at that time. A Ockershausen:	It was electric. Kathleen Matthews:	Radio 63, I mean it was the most listened to radio station. It had a huge robust news department, amazing public affairs department. They did documentaries on the air, and also then the Great Talk, and it was so much a part of this community. And the job I was interviewing for was called, “editorial director”. It was an entry-level job, but it sounded so important. And my job was to do the research on issues, and then write editorials for the station management. And in those days, 40 years ago, we were editorializing get the guns off the streets of Washington. Kathleen Matthews:	We talked about this being Dodge City. D.C. was Dodge City. And so we said, “Get the guns off the street.” We said, “Let’s build a metro-system. We need funding to be able to build a metro-system for the nation’s capital.” I mean, think about what the city was like back then, and where we are today. Janice Iacona Ockershausen:	Bud Steele. Kathleen Matthews:	Bud Steele, yeah. Kathleen Matthews:	You had Ed Walker. Ed Walker in the mornings doing his show. A Ockershausen: Oh my God. Eddie and Willard worked with Harden and Weaver. Bob Ryan was feeding us the weather, and then of course we had Trumbull and Core, that people used to come that worked here, would come stand in the window just to listen to them do their bits, whatever they were. Kathleen Matthews:	The banter. The banter was just so much fun. It was smart. It captured all of the issues that we were dealing with, but it also was, these were friends that this nation’s capital had here at this radio station. It was a conversation with the community. Kathleen Matthews:	And that close, sort of rapport that everybody here had with their listeners was so important. A Ockershausen:	You know I used to … Growing up in the sales end of the business, I had wanted to be a sports announcer. I told that story, and the guy that was head of sports named Jim Givens said, “There’s no money in that. They’ll fire you, but you get into sales, you’ll always have a job. You’ll always make a lot of money.” And they were right. So that led me into the sales world, and I would preach to our talent, and that was one of our secrets of success, “Don’t read the commercial. Sell the products, in your own words, in your own way.” And that was the … we would not let our newsmen do commercials, but the announcers would come on, and they would sell the product. So the news people all knew it, and they were proud of the commercials. You know they didn’t shy away from it. That was our success. And then your success being on top of that, you watched it grow up so you got ideas of what was going on in this town, in Our Town. Kathleen Matthews:	I grew so much. I was here actually only nine months, because at that point there still was that really close relationship with WJLA-TV. Kathleen Matthews:	… media family. And so when I heard that there was a job as a writer over at television, I applied for that and got recommendations from the folks in the newsroom here. Kathleen Matthews:	And went over to WJLA, and many of the people at WJLA, who were the street reporters had been radio reporters here first. People like Gary Reals for example. A Ockershausen:	Who’s still around, of course. Kathleen Matthews:	Yeah, you should get him on the show, if you haven’t already. Kathleen Matthews:	I remember that. I remember his star rose so fast. A Ockershausen:	Is that amazing? A Ockershausen:	He came and did the morning show. A Ockershausen:	He reinvented himself. Kathleen Matthews:	… then going to TV, going to the networks, and then coming back was just really amazing. A Ockershausen:	Well you know what? He came back and worked on on the air when Frank Harden lived, and he was doing the show. Jackson died. Tim came back to work with Janice and the people here. And they came home more or less. But I remember among all the great things, we had a lot of important people in the two stations. We had the tennis tournament. Remember the tennis tournament we had? Everybody in the station was eligible to play. I remember you and I played a match, and it was so much fun. And we had some good players, but it was bringing people together. Kathleen Matthews:	Yeah. It really was. A Ockershausen:	And Kathy, you were so great Kathleen. Kathleen Matthews:	Well I had played tennis at Stanford, and I had played tennis pretty much every day of my life since I was maybe in 2nd grade. A Ockershausen:	You were a player. A Ockershausen:	It couldn’t be. It couldn’t be 25 years. A Ockershausen:	You’re too young. Kathleen Matthews:	… tennis kind of fell lower and lower on my list of priorities, and every now and then I say, you know maybe I’ll get back to really playing tennis, and I can join the senior circuit now. A Ockershausen:	Kathleen. You were not over there 25 years. Impossible. A Ockershausen:	Well you paid your dues. Kathleen Matthews:	… Gordon Peterson, and Leon Harris, and Del Walters. A Ockershausen:	And you got your own show. Kathleen Matthews:	And got my Working Woman TV show, which was a wonderful opportunity, because women really were moving, not only into the workforce, but moving into positions of leadership. Kathleen Matthews:	And you know, executives in business, political leaders, and that was a show that really tracked women’s successes, but also their challenges. A Ockershausen:	Great program. And you had a sponsor too. Kathleen Matthews:	Toyota was our sponsor, as was Marshall’s. I used to wear clothes from Marshall’s because they were one of the sponsors of the show. A Ockershausen:	Good clothes though. Kathleen Matthews:	They’d ship boxes of clothes, and I got to really like Marshall’s. 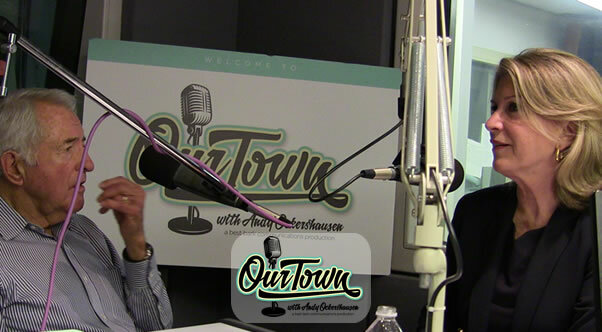 A Ockershausen:	Well we’re talking to Kathleen Matthews on Our Town. And we’re going to come back and talk more about your career in TV, and why you left us in radio up the creek, but you did it for good reasons. This is Our Town. A Ockershausen:	This is Andy Ockershausen. This is Our Town. We’re chatting with Kathleen Matthews, a very dear friend of many years. I can’t believe that she left WMAL Radio and went to TV, WMAL-TV for 25 years, and then became an executive at Marriott. It just goes on and on with you. Kathleen Matthews:	Well what was so great about that was, you know I was in television during a wonderful period, when local news across this country had more viewers and most people got their information from local TV news. And we also did documentaries. We did in-depth reporting, and it was really a heyday I think, for local television and local journalism. And I loved it, and for me it was always a learning curve, because you know every day you’re out on another story. Kathleen Matthews:	You have to always stay up with what’s happening in the news, but you also get really involved in your community. So you’re constantly being invited to MC charity events. Ultimately I was invited to join the boards of many local charities, because I started by maybe doing a story on their good work, and then they’d invite me back to MC one of their galas, and pretty soon they’d invite me to join the board. And through that nonprofit work, I got to know business leaders as well in this community. A Ockershausen:	You would be the first one in that job? Kathleen Matthews:	Well no, there was a person retiring in that job. A Ockershausen:	He created a job for you. Kathleen Matthews:	He created a perfect job for me. A Ockershausen:	For your talent. Kathleen Matthews:	And I was able to move into a job that suddenly stretched me again in new ways. Where I had a tremendous learning curve, I could bring my skills, but I also could gain new ones. And Marriott is such a good company. It is like WMAL was in those old days. It’s got a tremendous culture. It puts people first. A Ockershausen:	Starts from the top. Kathleen Matthews:	… and just all of those things I described, so that was a wonderful transition for me. And I’m so grateful I had that chance to really develop a new skill-set. And also to see the world in the process, as that company has grown tremendously. A Ockershausen:	You hit the jackpot. But one of the things you learned and did at Channel 7, you did it here too, everywhere you went, being involved in the community. Giving and you get back so much when you give, whether it’s charity or whatever it is. When you give, the returns are enormous. Kathleen Matthews:	I think the returns are exponential, you know. For me serving on charity boards was my first experience with doing budgets, with branding, you know how you brand a company, how you develop that loyalty and identity in a community. And those were great business skills for me to get. Kathleen Matthews:	And I didn’t even realize it. I thought I was just sort of helping out. But then also that incredible karma you get from being part of transforming peoples lives. So one of my favorite was Suited for Change, which was helping women move from welfare to work by having professional women give clothing that they weren’t wearing anymore. You know maybe they gained weight or lost weight or styles had changed enough that they wanted something new. And we had a clothing bank, but we also gave skills on how you write resumes, and how you build confidence, and how you present yourself. That organization is now like 20 years old and doing tremendous work in this community. And I was part of its early days. I loved that work. A Ockershausen:	Well you can see the success. When you look back, you see all the things that you worked with that improve so much, and great for Our Town, for the community. The two things that I used to preach, and I belonged to everything. I probably ruined my life because I went everywhere and did everything, and charity, some good, but all business association. But I would preach at business people, “You get good business by giving to the public. Get these people off of relief. Get them up.” My friend Catherine Meloy has done something with Marriott down in the new building on Massachusetts Avenue. She got her whole people from Goodwill, they’re working now. They’ve learned a business. A Ockershausen:	You probably started it. A Ockershausen:	A beautiful place. Kathleen Matthews:. . . what they said is we’ve got a problem in Washington with long-term unemployed people, who’ve not been able to get jobs. Here we have a brand new hotel. We need new employees. Let’s form a partnership with Goodwill, who has connections with people who’ve been long-term unemployed, who they’re trying to train, and let’s make that our job hiring pipeline. Kathleen Matthews:	And the loyalty you get from people like that, when you give them a job. The best thing you can do in business is provide jobs to people. A Ockershausen:	No question about it. Get them a job. Work. Kathleen Matthews:	That’s the best kind of community service you can really do. I had a chance when I was at Marriott to work on a project in Haiti. And the company had generously given money to the Red Cross after the Haiti earthquake, but we had a chance to consider doing more. And I suggested to Bill Marriott, why don’t we build a hotel in Haiti? Because that will create sustainable jobs. Kathleen Matthews:	It’ll also help the country develop its tourism infrastructure. A Ockershausen:	Kathleen that’s amazing. A Ockershausen:	After a disaster, you did something important for the community. Kathleen Matthews:	And we did that project. And it was like the best thing we could possible do in a country like Haiti. A Ockershausen:	Oh yeah. Instead of giving it to them, you made an opportunity for them to earn it. And that pays great dividends. We’re involved, you probably know this, with the school Don Bosco Cristo Rey and it’s a passion for us, and we’ve seen it grown. This is the 10th anniversary for Don Bosco. So to stay alive for 10 years has been great, but to watch the dividends from our students that are graduating, you probably see it all the time. All the things that you’ve done and involvement, and by getting Channel 7, was so community oriented. But the world changes, big companies now run the communication business. It’s gone. What we had is not gonna ever happen again. A Ockershausen:	Tom Cookerly started that charity you know. Kathleen Matthews:	That’s right, Tom Cookerly, what a great guy too. A Ockershausen:	He’s a good friend. Kathleen Matthews:	He was my general manager. A Ockershausen:	Oh I know that. Kathleen Matthews:	And one of my great mentors like you Andy. A Ockershausen:	He and I are still on the Board. Kathleen Matthews:	And I’ve had these great mentors. So Neediest Kids is still alive today. A Ockershausen:	Very much so. Kathleen Matthews:	Sometimes it gets different sponsorship, so it went from Channel 7 to Booz Allen. A Ockershausen:	Booz Allen was a big developer of that. Kathleen Matthews:	But you know, I think some TV stations are realizing that they need to do those things again, you know? A Ockershausen:	Channel 4 does it. They are very involved in the community. They do as much as anybody. Now, for a while I worked for ABC, CBS Radio owned our company, and then NBC you bought our company. So I worked for all of them, and I can see the change that NBC has brought to Channel 4. They’re spending money now, and they had the clamps on money when GE owned them. Wendy Rieger told me that. She couldn’t get a crew. Now she can get anything she wants from NBC. What a big change. Kathleen Matthews:	Yeah, NBC, Comcast, Comcast, yeah. A Ockershausen:	Comcast is fabulous, oh my God. Kathleen Matthews:	Yeah, Comcast ownership. Yeah, and you did Comcast Sports for a long time. A Ockershausen:	Absolutely. They paid me a long time. They don’t know what I did, but they paid me. They paid me sometimes not to come in. We’re talking to Kathleen Matthews and this is Our Town. It’s Andy Ockershausen, and I’m going to come back and talk about your family. A Ockershausen:	This is Andy Ockershausen and this is Our Town. We’re talking about what happened with you and Marriott, and what they did for Our Town. But what you did for Our Town is monumental. Kathleen Matthews:	Oh, well I don’t know about that, but you’re so nice to say it. A Ockershausen:	Well I think it is. Kathleen Matthews:	I feel so blessed that I crossed this country, from California where I grew up, and I still have California roots. I have a sister out there. A Ockershausen:	Poor little girl from California. Kathleen Matthews:	My daughter is out at Stanford Business School right now. Kathleen Matthews:	And I went to Stanford undergrad, so I just was out visiting her, and it’s so great to be on that campus again. And so, my heart is still a little bit in San Francisco and California. A Ockershausen:	Absolutely. So is Tiger Woods. Kathleen Matthews:	But Washington is such a vibrant, exciting, and important place. You know from the politics, to the business community here, to all the nonprofits, and then the local environment of DC, Maryland, and Virginia. And the challenges that we wrestle with from schools, to transportation. A Ockershausen:	Politics. It’s a great balance. It’s a great thing, I think. Kathleen Matthews:	It’s just a really, really interesting place. And it’s fun for me to watch this next generation. So my kids are now 33, 30, and 27, and my boys are back in Washington working on a movie. They both went into the film business. Kathleen Matthews:	One is an actor, and he’s now become a writer and director. And my oldest son, who is a writer, director, producer, and they’ve been doing films. A Ockershausen:	What a great thing. A Ockershausen:	Kemp Mill Records just closed the last store too. What do you think of that? Kathleen Matthews:	Wow. I mean, you know, they’ve got the, is it called Hank Dietle’s, that funky little place up on Rockville Pike is in there. You know they’ve got scenes in Kensington. Kathleen Matthews:	… with a murder mystery thrown in. You know? And so it’s really fun to have them working. Janice Iacona Ockershausen:	We need them on Our Town. A Ockershausen:	We’d love to have the boys. Kathleen Matthews:	And you know, it’s just to have seen them grow up here. A Ockershausen:	Didn’t we have The Witch, or some movie about a witch that’s somewhere in Clarksville? Kathleen Matthews:	The Blair Witch Trial. I mean they’ve got camera people, and production people, that have come in from California, Baltimore, but also people from the DC area. Kathleen Matthews:	Talent from here. A Ockershausen:	What an exciting thing for you to watch these kids, huh? Kathleen Matthews:	Yeah, it really is. A Ockershausen:	I remember a lot of your travels. I’ve seen pictures when you went to Africa with elephants and camels and everywhere you went with Chris, and I watched those kids grow up. But it’s amazing, they’re part of Our Town now. Kathleen Matthews:	You’re talking about the annual holiday card there with the kids. A Ockershausen:	You can give back that way. A Ockershausen:	That was Connie Morella’s seat at one time. Kathleen Matthews:	It was at one point. A Ockershausen:	She’s going to be here with us. Kathleen Matthews:	And I just thought this was a wonderful way to give back to this community. A Ockershausen:	Good for you. They need you in politics. Kathleen Matthews:	To represent people, to give voice to the increasingly diverse community that we have here. And so I didn’t win that election, but I haven’t given up. I’m staying involved in local politics. A Ockershausen:	Stay alive. You’re still alive. Look if you don’t go to bat, you’re going up there and swing. You gotta keep swinging. You’ll sometime hit that long ball. I’m sure of that. A Ockershausen:	So did Barry Goldwater. Kathleen Matthews:	… I’m a Democrat, and the Democrats in this area really care about our country, and they’re trying to figure out how they make adifference in the current political environment. And I’m all about being part of that process, and helping give voice to the values that I think are so important. A Ockershausen:	And you do it so well, and you know we’re close to Steny Hoyer. We’re not political close to him, but he’s a very dear friend. His wife used to be Janice’s grade-school teacher. Janice Iacona Ockershausen:	First grade, yeah. Kathleen Matthews:	Yeah, what a wonderful woman she was, and we lost her way to young. But Steny’s a great person. He’s given his entire life to public service. A Ockershausen:	We love Steny. He’s a hoot, and we know him through business in Washington. He always comes everything … He’s going to be on our show. Janice is going to get him, no matter what, because we love Steny. A Ockershausen:	Yeah, you know it. Kathleen Matthews:	… I’m headed to Vietnam. I was in India for the Christmas Holidays with my family. I’ve seen so many parts of the world, and we are just so fortunate to be Americans here in this community. A Ockershausen:	And thank you for Marriott, and what you did for them. And your future in politics is … You learned a lot about politics, probably from Joe Allbritton. You’ve had some great bosses haven’t you? Kathleen Matthews:	And Bill Marriott, you know? I really have. A Ockershausen:	Albritton loved you, I know that. He was a great friend of ours. He came in here like a whirlwind, and I got to know him quite, quite well over the years. But you’re going to be the head of the Maryland DNC, or the DC? Kathleen Matthews:	Well, I’m looking for anyway that I can sort of really help the Democratic Party in Maryland. Kathleen Matthews:	But also give voice to the values that I think are important nationally. So you’re going to see me involved. A Ockershausen:	Well good for you. And Chris is your enormous shoulder to lean on. I’m sure of that. Kathleen Matthews:	He is, you know he’s got a stay … Our careers have always really paralleled, and sort of complimented each other. But we’ve also had to kind of keep our distance from each other. A Ockershausen:	You’ve got your own life. Kathleen Matthews:	He couldn’t get involved in my political campaign. He can’t be involved in some of the real party politics, but I have to tell you, you don’t have a hard time guessing what we talk about every night. Over the dinner table, at pillow talk, you know I watch his show at night, and then we talk about what he really thought, and we live and breathe it. A Ockershausen:	Absolutely. He’s your rock. Listen, he did Rush Limbaugh. He substituted for Rush one time. You remember that? Kathleen Matthews:	I think I do. Right here, right? A Ockershausen:	I called him and say, “I can’t believe Chris, what I just heard. You substituting for Limbaugh.” He said, “Yeah, it’s a good audience. He’s got a big audience.” Well Kathleen, I can’t thank you enough for being you. Kathleen Matthews:	Well thank you. A Ockershausen:	You’ve been so important to us, Our Town. Kathleen Matthews:	And I love having you in my life, and how we’ve intersected at so many different places and at different times and to continue to do that. A Ockershausen:	Over the years, airplanes, trips, travel. A Ockershausen:	And you’re still gorgeous, as you were. You must have been 22 years old. Is that correct? Kathleen Matthews:	But not as good a tennis player as I once was. A Ockershausen:	No, I know. But we did, we had a great time, and thank you for all the kind words. And thank you for all the things you do, and keep fighting, hang in there, whatever it is. We need you. Kathleen Matthews:	Thank you. Thanks for sharing Our Town with me. A Ockershausen:	Kathleen Matthews at Our Town. This is Andy Ockershausen, and we appreciate it so much Kathleen. Announcer:	You’ve been listening to Our Town, Season Two. Presented by GEICO, our home town favorite with your host Andy Ockershausen. New Our Town episodes are released every Tuesday and Thursday. Drop us a line with your comments or suggestions. See us on Facebook or visit our website at ourtowndc.com. Our special thanks to Ken Hunter, or technical director, and WMAL Radio in Washington DC for hosting our podcast. And thanks to GEICO. 15 minutes can save you 15% or more on car insurance.